To our dear friends and family. There simply are no words to express the deep sorrow in our hearts. Today our little boy, Titus, lost his heartbeat somewhere between this morning and this afternoon and went to be with Jesus. This comes as such a shock to us all. We have shared tears and prayers and joy from the very second he was discovered in Renee’s tummy. We cannot express enough how grateful we are to have had the chance to be Titus’ mom and dad for these past 9 months, and truly count that as a blessing, and a deep honor. We stand on the hope of the cross of Jesus, without His love, grace, and faithfulness, and His sovereignty, we have nothing. These past weeks as we as a body have been in Philippians, I have thought so much about Paul’s words about sharing in the sufferings of Jesus. We humbly, and obediently walk forward in this. Our desire is to allow ourselves to feel the full weight of this tragedy, emotionally, physically and spiritually, and yet choose hope, choose rest, and choose to continue to glorify God with our lives and with our family. Titus belongs to God. We belong to God. It is our deep prayer that this circumstance would leave such an echo of the realness and presence of Jesus in this world. May He receive all glory, every minute of the way. I pray for everyone we will come into contact with in this process, that the Holy Spirit would make Himself evident and that their lives will be saved for eternity in Christ, that is our only end in this life. We want you to grieve with us and share our burdens, but be affirmed, Titus needs no grief for himself, he is in a better place, we hold tightly to that. The more despair you have on our behalf, even if well intended, will only make it harder for us. We have the people we need to walk us through this. We appreciate your words and thoughts, but what we need is your prayers and your silence. Thank you for honoring that, it is a difficult thing for me to write. Allow us room and space, and trust us to communicate our needs and wants as they come. As you can imagine, we are spinning. Renee goes in tonight for a C-section, we don’t have any details as to what went wrong, and we may not. We will communicate those to the church leadership as soon as we know. I do not know what else to say. We love you. We know we are loved by you. Thank you for being our family. May His kingdom come and His will be done. Feel free to pass this email along if you feel led to. The more people that know, the better, and the less we have to explain the situation. jared and I did the Bridal Bazaar last Sunday. It was super fun meeting new people and just seeing so many happy couples. I’m so sorry that the Photo Friday is so “business related” today but so it is…. We need your votes!!!! If you could please click on the button and vote for us for the 10news A-list, we’ll be your best friends 🙂 If you want you can also write a little note. Anything helps! 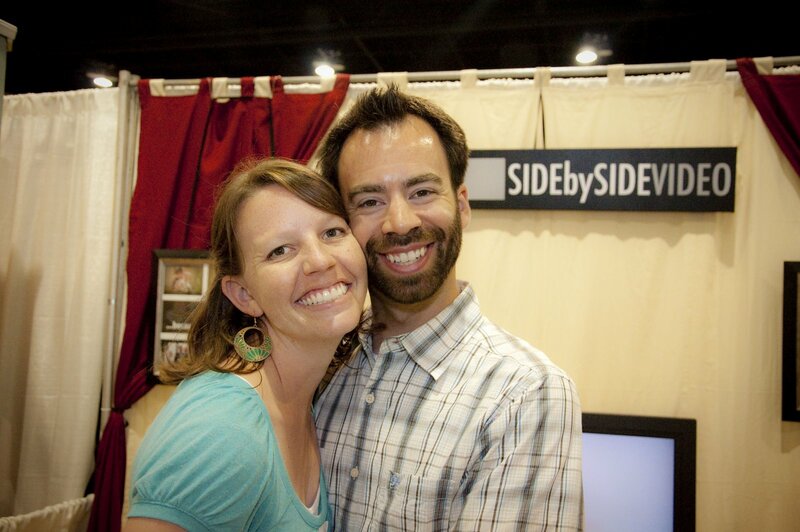 We love you all and appreciate the support of SidebySide Video! !